Most people think that selling your car, avoiding flights and going vegetarian are the best strategies for fighting climate change, but in fact, according to a study into true impacts of different green lifestyle choices, having fewer children beats all those actions by a very long margin……. I’ve been saying this for years and years, but the graphic below might just about convince anyone…….. Besides, who in their right mind would want to bring children into this dysfunctional world? Oh wait…… nobody is in their right mind! I’ve been following Salatin for years, and he is truly inspiring……. my goal is to run the Fanny Farm as a scaled down version of Polyface Farm……. I do wish he wouldn’t put all ‘greenies’ in the same basket though! The following post originally appeared on the Polyface Farms Facebook page. Cows at Polyface Farm. Photo by Amber Karnes. The recent editorial by James McWilliams, titled “The Myth of Sustainable Meat,” contains enough factual errors and skewed assumptions to fill a book, and normally I would dismiss this out of hand as too much nonsense to merit a response. But since it specifically mentioned Polyface, a rebuttal is appropriate. For a more comprehensive rebuttal, read the book Folks, This Ain’t Normal. Let’s go point by point. First, that grass-grazing cows emit more methane than grain-fed ones. This is factually false. Actually, the amount of methane emitted by fermentation is the same whether it occurs in the cow or outside. Whether the feed is eaten by an herbivore or left to rot on its own, the methane generated is identical. Wetlands emit some 95 percent of all methane in the world; herbivores are insignificant enough to not even merit consideration. Anyone who really wants to stop methane needs to start draining wetlands. Quick, or we’ll all perish. I assume he’s figuring that since it takes longer to grow a beef on grass than on grain, the difference in time adds days to the emissions. But grain production carries a host of maladies far worse than methane. This is simply cherry-picking one negative out of many positives to smear the foundation of how soil builds: herbivore pruning, perennial disturbance-rest cycles, solar-grown biomass, and decomposition. This is like demonizing marriage because a good one will include some arguments. As for his notion that it takes too much land to grass-finish, his figures of 10 acres per animal are assuming the current normal mismanagement of pastures. At Polyface, we call it neanderthal management, because most livestock farmers have not yet joined the 20th century with electric fencing, ponds, piped water, and modern scientific aerobic composting (only as old as chemical fertilization). Hence, while his figures comparing the relative production of grain to grass may sound compelling, they are like comparing the learning opportunities under a terrible teacher versus a magnificent teacher. Many farmers, in many different climates, are now using space-age technology, biomimicry, and close management to get exponential increases in forage production. The rainforest, by the way, is not being cut to graze cattle. It’s being cut to grow transgenic corn and soybeans. North America had twice as many herbivores 500 years ago than it does today due to the pulsing of the predator-prey-pruning cycle on perennial prairie polycultures. And that was without any corn or soybeans at all. Apparently if you lie often and big enough, some people will believe it: Pastured chicken has a 20 percent greater impact on global warming? Says who? The truth is that those industrial chicken houses are not stand-alone structures. They require square miles of grain to be carted into them, and square miles of land to handle the manure. Of course, many times that land is not enough. To industrial farmers’ relief, more often than not a hurricane comes along just in time to flush the toilet, kill the fish, and send pathogens into the ocean. That’s a nice way to reduce the alleged footprint, but it’s devilish sleight of hand with the data to assume that ecological toxicity compensates for the true land base needed to sustain a factory farm. While it’s true that at Polyface our omnivores (poultry and pigs) do eat local GMO (genetically modified organism)-free grain in addition to the forage, the land base required to feed and metabolize the manure is no different than that needed to sustain the same animals in a confinement setting. Even if they ate zero pasturage, the land is the same. The only difference is our animals get sunshine, exercise, fresh pasture salad bars, fresh air, and a respectful life. Chickens walking on pasture certainly do not have any more leg sprains than those walking in a confinement facility. To suggest otherwise, as McWilliams does, is sheer nonsense. Walking is walking — and it’s generally considered to be a healthy practice, unless you’re a tyrant. Interestingly, in a lone concession to compassion, McWilliams decries ranging hogs with rings in their noses to keep them from rooting, lamenting that this is “one of their most basic instincts.” Notice that he does not reconcile this moral imperative with his love affair with confinement hog factories. Nothing much to use their noses for in there. For the record, Polyface never rings hog noses, and in the few cases where we’ve purchased hogs with rings, we take them out. We want them to fully express their pigness. By moving them frequently using modern electric fencing, polyethylene water piping, high-tech float valves, and scientifically designed feed dispensers, we do not create nor suffer the problems encountered by earlier large-scale outdoor hog operations 100 years ago. McWilliams has apparently never had the privilege of visiting a first-rate, modern, highly managed, pastured hog operation. He thinks we’re all stuck in the early 1900s, and that’s a shame because he’d discover the answers to his concerns are already here. I wonder where his paycheck comes from? Then McWilliams moves on to the argument that economic realities would kick in if pastured livestock became normal, driving farmers to scale up and end up right where we are today. What a clever ploy: justify the horrible by eliminating the alternatives. At Polyface, we certainly do not discourage scaling up — we actually encourage it. We think more pasture-based farms should scale up. Between the current abysmal state of mismanagement, however, and efficient operations, is an astronomical opportunity to enjoy economic and ecological advantages. McWilliams is basing his data and assumptions on the poorest, the average or below. If you want to demonize something, always pick the lowest performers. But if you compare the best the industry has to offer with the best the pasture-based systems have to offer, the factory farms don’t have a prayer. Using portable infrastructure, tight management, and techno-glitzy tools, farmers running pastured hog operations practically eliminate capitalization costs and vet bills. Finally, McWilliams moves to the knock-out punch in his discussion of nutrient cycling, charging specifically that Polyface is a charade because it depends on grain from industrial farms to maintain soil fertility. First of all, at Polyface we do not assume that all nutrient movement is anti-environmental. In fact, one of the biggest reasons for animals in nature is to move nutrients uphill, against the natural gravitational flow from high ground to low ground. This is why low lands and valleys are fertile and the uplands are less so. Animals are the only mechanism nature has to defy this natural downward flow. Fortunately, predators make the prey animals want to lounge on high ground (where they can see their enemies), which insures that manure will concentrate on high lookout spots rather than in the valleys. Perhaps this is why no ecosystem exists that is devoid of animals. The fact is that nutrient movement is inherently nature-healing. But, it doesn’t move very far. And herein lies the difference between grain used at Polyface and that used by the industry: We care where ours comes from. It’s not just a commodity. It has an origin and an ending, start to finish, farmer to eater. The closer we can connect the carbon cycles, the more environmentally normal we will become. Second, herbivores are the exception to the entire negative nutrient flow argument because by pruning back the forage to restart the rapid biomass accumulation photosynthetic engine, the net carbon flow compensates for anything lost through harvest. Herbivores do not require tillage or annuals, and that is why all historically deep soils have been created by them, not by omnivores. It’s fascinating that McWilliams wants to demonize pasture-based livestock for not closing all the nutrient loops, but has no problem, apparently, with the horrendous nutrient toxicity like dead zones in the Gulf of Mexico the size of New Jersey created by chemical fertilizer runoff to grow grain so that the life of a beef could be shortened. Unbelievable. In addition, this is one reason Polyface continues to fight for relaxing food safety regulations to allow on-farm slaughtering, precisely so we can indeed keep all these nutrients on the farm and not send them the rendering plants. If the greenies who don’t want historically normal farm activities like slaughter to occur on rural acreage could understand how devastating these government regulations actually are to the environmental economy, perhaps McWilliams wouldn’t have this bullet in his arsenal. And yes, human waste should be put back on the land as well, to help close the loop. Third, at Polyface, we struggle upstream. Historically, omnivores were salvage operations. Hogs ate spoiled milk, whey, acorns, chestnuts, spoiled fruit, and a host of other farmstead products. Ditto for chickens, who dined on kitchen scraps and garden refuse. That today 50 percent of all the human edible food produced in the world goes into landfills or greenie-endorsed composting operations rather than through omnivores is both ecologically and morally reprehensible. At Polyface, we’ve tried for many, many years to get kitchen scraps back from restaurants to feed our poultry, but the logistics are a nightmare. The fact is that in America we have created a segregated food and farming system. In the perfect world, Polyface would not sell eggs. Instead, every kitchen, both domestic and commercial, would have enough chickens proximate to handle all the scraps. This would eliminate the entire egg industry and current heavy grain feeding paradigm. At Polyface, we only purport to be doing the best we can do as we struggle through a deviant, historically abnormal food and farming system. We didn’t create what is and we may not solve it perfectly. But we’re sure a lot farther toward real solutions than McWilliams can imagine. And if society would move where we want to go, and the government regulators would let us move where we need to go, and the industry would not try to criminalize us as we try to go there, we’ll all be a whole lot better off and the earthworms will dance. AND here’s a lecture Joel gave in Australia last year…….. NOTHING we do is sustainable……..
Here’s a thoroughly modern riddle: what links the battery in your smartphone with a dead yak floating down a Tibetan river? The answer is lithium – the reactive alkali metal that powers our phones, tablets, laptops and electric cars. There are pictures of masses of dead fish on the surface of the stream. Some eyewitnesses reported seeing cow and yak carcasses floating downstream, dead from drinking contaminated water. 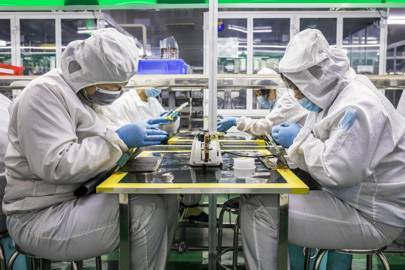 It was the third such incident in the space of seven years in an area which has seen a sharp rise in mining activity, including operations run by BYD, the world’ biggest supplier of lithium-ion batteries for smartphones and electric cars. After the second incident, in 2013, officials closed the mine, but when it reopened in April 2016, the fish started dying again. But there’s a problem. As the world scrambles to replace fossil fuels with clean energy, the environmental impact of finding all the lithium required to enable that transformation could become a serious issue in its own right. “One of the biggest environmental problems caused by our endless hunger for the latest and smartest devices is a growing mineral crisis, particularly those needed to make our batteries,” says Christina Valimaki an analyst at Elsevier. Tahua, Bolivia. Salt miners load a truck with lithium-rich salt. The ground beneath Bolivia’s salt flats are thought to contain the world’s largest reserves of the metal. (The Bolivian Andes may contain 70 per cent of the planet’s lithium.) 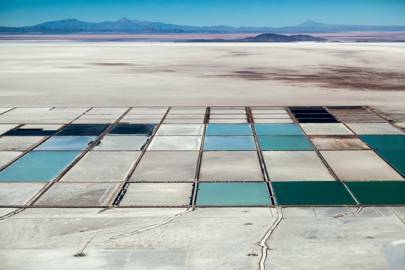 Many analysts argue that extracting lithium from brine is more environmentally friendly than from rock. However, as demand increases, companies might resort to removing lithium from the brine by heating it up, which is more energy intensive. In South America, the biggest problem is water. 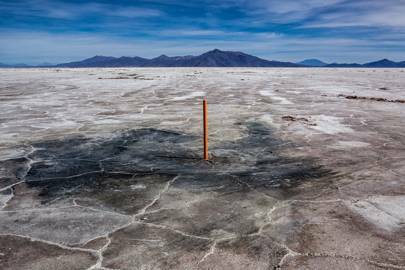 The continent’s Lithium Triangle, which covers parts of Argentina, Bolivia and Chile, holds more than half the world’s supply of the metal beneath its otherworldly salt flats. It’s also one of the driest places on earth. 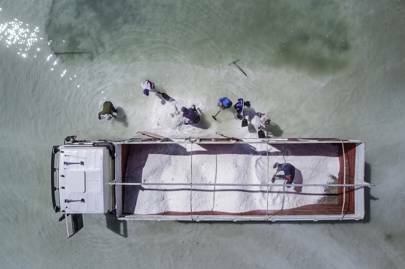 That’s a real issue, because to extract lithium, miners start by drilling a hole in the salt flats and pumping salty, mineral-rich brine to the surface. Then they leave it to evaporate for months at a time, first creating a mixture of manganese, potassium, borax and lithium salts which is then filtered and placed into another evaporation pool, and so on. After between 12 and 18 months, the mixture has been filtered enough that lithium carbonate – white gold – can be extracted. 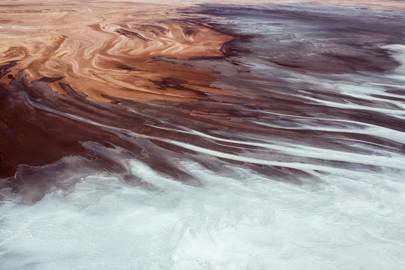 It’s a relatively cheap and effective process, but it uses a lot of water – approximately 500,000 gallons per tonne of lithium. In Chile’s Salar de Atacama, mining activities consumed 65 per cent of the region’s water. That is having a big impact on local farmers – who grow quinoa and herd llamas – in an area where some communities already have to get water driven in from elsewhere. There’s also the potential – as occurred in Tibet – for toxic chemicals to leak from the evaporation pools into the water supply. These include chemicals, including hydrochloric acid, which are used in the processing of lithium into a form that can be sold, as well as those waste products that are filtered out of the brine at each stage. In Australia and North America, lithium is mined from rock using more traditional methods, but still requires the use of chemicals in order to extract it in a useful form. Research in Nevada found impacts on fish as far as 150 miles downstream from a lithium processing operation. According to a report by Friends of the Earth, lithium extraction inevitably harms the soil and causes air contamination. 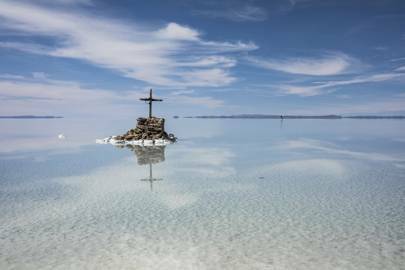 In Argentina’s Salar de Hombre Muerto, locals claim that lithium operations have contaminated streams used by humans and livestock, and for crop irrigation. In Chile, there have been clashes between mining companies and local communities, who say that lithium mining is leaving the landscape marred by mountains of discarded salt and canals filled with contaminated water with an unnatural blue hue. But lithium may not be the most problematic ingredient of modern rechargeable batteries. It is relatively abundant, and could in theory be generated from seawater in future, albeit through a very energy-intensive process. Two other key ingredients, cobalt and nickel, are more in danger of creating a bottleneck in the move towards electric vehicles, and at a potentially huge environmental cost. Cobalt is found in huge quantities right across the Democratic Republic of Congo and central Africa, and hardly anywhere else. The price has quadrupled in the last two years. Unlike most metals, which are not toxic when they’re pulled from the ground as metal ores, cobalt is “uniquely terrible,” according to Gleb Yushin, chief technical officer and founder of battery materials company Sila Nanotechnologies. “One of the biggest challenges with cobalt is that it’s located in one country,” he adds. You can literally just dig up the land and find cobalt, so there’s a very strong motivation to dig it up and sell it, and a a result there’s a lot of motivation for unsafe and unethical behaviour.” The Congo is home to ‘artisanal mines’, where cobalt is extracted from the ground by hand, often using child labour, without protective equipment. There’s also a political angle to be considered. 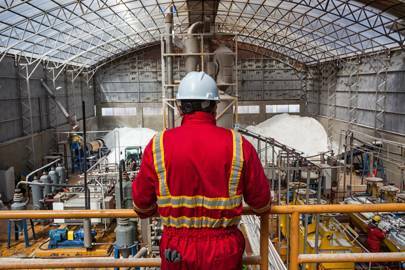 When Bolivia started to exploit its lithium supplies from about 2010, it was argued that its huge mineral wealth could give the impoverished country the economic and political heft that the oil-rich nations of the Middle East. 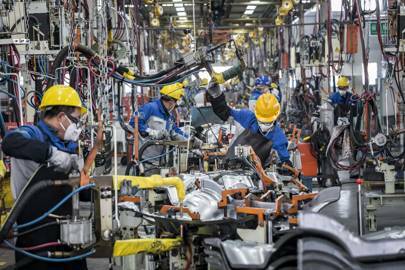 “They don’t want to pay a new OPEC,” says Lisbeth Dahllöf, of the IVL Swedish Environmental Institute, who co-authored a report last year on the environmental footprint of electric car battery production. In a recent paper in the journal Nature, Yushin and his co-authors argued that new battery technology needs to be developed that uses more common, and environmentally friendly materials to make batteries. Researchers are working on new battery chemistries that replace cobalt and lithium with more common and less toxic materials. At the University of Birmingham, research funded by the government’s £246m Faraday Challenge for battery research is trying to find new ways of recycling lithium-ion. Research in Australia found that only two per cent of the country’s 3,300 tonnes of lithium-ion waste was recycled. Unwanted MP3 players and laptops can end up in landfill, where metals from the electrodes and ionic fluids from the electrolyte can leak into the environment. A consortium of researchers, led by the Birmingham Energy Institute are using robotics technology developed for nuclear power plants to find ways to safely remove and dismantle potentially explosive lithium-ion cells from electric vehicles. There have been a number of fires at recycling plants where lithium-ion batteries have been stored improperly, or disguised as lead-acid batteries and put through a crusher. Another barrier, says Dr Gavin Harper of the Faraday Institution’s lithium recycling project, is that manufacturers are understandably secretive about what actually goes into their batteries, which makes it harder to recycle them properly. At the moment recovered cells are usually shredded, creating a mixture of metal that can then be separated using pyrometallurgical techniques – burning. But, this method wastes a lot of the lithium. UK researchers are investigating alternative techniques, including biological recycling where bacteria are used to process the materials, and hydrometallurgical techniques which use solutions of chemicals in a similar way to how lithium is extracted from brine to begin with. For Harper, it’s about creating a process to shepherd lithium-ion batteries safely through their whole lifecycle, and making sure that we’re not extracting more from the ground unnecessarily, or allowing chemicals from old batteries to do damage. “Considering that all of the materials in these batteries have already had an environmental and social impact in their extraction, we should be mindful of ensuring good custody,” he says. I have a new hero……. forget renewable energy, the next revolution will be, must be, regenerative farming….. or we are truly stuffed. Charles Massy OAM Author and radical farmer’s new book ‘Call of the Reed Warbler’ explores transformative and regenerative agriculture and the vital connection between our soil and our health. According to Massy, we need a revolution — he believes that human health, our communities, and the very survival of the planet depend on it. Charles is coming to the Library to talk about how he believes a grassroots revolution can save the planet, help turn climate change around, and build healthy people and healthy communities, pivoting significantly on our relationship with growing and consuming food. Two weeks ago, I left my cocoon in Geevo and flew to Queensland for the first time in over two years… and no, I will not be driving back in another ute! Glenda was supposed to join me in Tasmania around now, but, as they say, life puts paid to the best laid plans, and her mother now aged 94 had a fall, breaking her wrist and fracturing her pelvis, never a good idea at such a ripe old age. My flight was delayed for over an hour, and I didn’t arrive in Brisbane until past 11PM, then Virgin put my luggage on the wrong carousel, while my son was waiting outside to take me to his new place he shares with his partner and one other in a new apartment near the river. I’d heard all about this apartment, especially the bit about going from student poverty to working man riches…. but the view is so stunning, I had to pinch myself to make sure it wasn’t all a dream! I never thought I’d think of our son as “how the other half lives”! He might as well enjoy it while he can I guess, they have to live somewhere, and it’s sited unbelievably close to public transport. I brought the cold weather with me it appeared, my first morning there was the coldest Queensland had experienced in a very long time; mornings were actually several degrees less cold in Geeveston, though of course it never warmed up to 20 degrees at the Fanny Farm. The hustle and bustle of “the big smoke” always shocks me after the quiet life in Southern Tasmania, even though I lived in Brisbane for decades, and I of all people should not be shocked after writing reams about the unsustainability of our civilisation…. but it nevertheless brings it all home to me. What was also brought home to me is the unsustainability of keeping old people alive, using world best practice technology of course….. This is, like population, a very ticklish issue that nobody talks about. I’m almost thirty years younger than my mother in law, and I have already come to grips with the fact my days are numbered, even if they are not quite as numbered as hers, but the amount of resources, money, and energy spent on keeping her alive for what may not be more than three months is staggering……. How anyone measures what is or is not appropriate to keep a very old person comfortable is anyone’s guess. Can anyone even pass judgement? We do what we do, as my old friend Bruce once said to me, because we can. It’s how I flew up at short notice. Speaking of noticing, airfares have gone up 50% since last time I did this…. The flurry of activity since Betty’s return from hospital is amazing. A new ramp that probably cost $3000 has been built so her wheelchair can accommodate the single step difference between the house floor and the ground outside. We’ve had physios, occupational therapists and a social worker call to assess the situation. Tomorrow, ‘a builder’ is coming to install a hook for Betty’s shower, presumably so she can be showered sitting down….. and I have no idea who’s paying for all this. A couple of days ago, she suddenly became quite ill, an ambulance was called, and I had to follow it all the way to Nambour Hospital (and of course return), a 100km trip. Luckily, she was transferred to Noosa which is just ten minutes away, but all the same, the amount of driving I am currently undertaking as the nominated driver is amazing. It’s a good thing Glenda’s little car runs on the smell of fumes because this amount of driving is easily four times as much as I am used to! Trained as I am by my INTJ personality to only see the amount of energy and resources needed to achieve these results, I feel like I have actually flown to a different planet. Then there’s the traffic….. and it’s not just me, friends I have since spoken to agree that congestion around Noosa is definitely on the up, and every second car is a SUV…. This place used to be a sleepy village, but no more. Since leaving Geevo, the weather has been doing its Tasmanian winter thing, lots of rain, mud everywhere, unlike here which is just like a Tasmanian summer; it’s unlikely I would have been able to do much around the farm anyway. Plus it stops me working on the house before my concrete reaches maximum strength… and building roofs in the rain is problematic at best. While here, I watched some stupid TV show about “Extreme Homes” that featured Far North Queensland houses, all so far over the top I was stunned…. but one in particular stood out. Here I am, feeling guilty about the 80 m³ of concrete I have now poured into Mon Abri, and this place comes up boasting, wait for it, 15,000 m³ of concrete……. I’m actually really really hoping it’s misreporting, and that maybe it was tonnes (each m³ of concrete weighs 2.5 tonnes). This monster house has apparently no timber whatever in it and is capable of withstanding category 5 cyclones. With 18kW (!) of PVs on its roof, the program classified it as zero energy house……. never mind the fact that this much concrete would emit nearly 20,000 tonnes of CO2 or 2000 years worth of emissions from your average Australian. When stupidity like this is spread on TV to people who will certainly believe it, what chance have we got? This will make more and more people, probably, aspire to building some similar monument to unsustainability….. Meanwhile, the Earth is burning, or where it’s not burning, it’s flooding, like Japan which just finished dealing with floods and landslides and is now facing a severe typhoon…. This diagram of how the climate statistics are changing just came up in my news feed. It pays to understand standard distribution curves I guess, but it’s a good explanation of what we’ll be facing in the future. I may stay in Queensland for another two weeks, but any longer will make me go mad. At least in Tassie I can sort of pretend I won’t be affected, and stick my head back in the sand. Everybody else is doing it…. Well you would not believe how bad it actually is…… and to think that China consumed more cement over a recent three year period than the US consumed during the entire 20th century, for results like this, is simply appalling…. and it’s fast looking like it was all wasted. There’s more to read about this on the Automatic Earth here….. an old article, but more relevant than ever.